Nothing else is quite like standing in front of an exceptional piece of art and experiencing it firsthand. We are so used to seeing images of paintings in books and on screens that it's easy to think we know what they're like. As our visitors can attest, there's a big difference between what a reproduction can convey versus the reality of top-quality physical pigments and changing light. When a highly skilled artist brings these elements together the result is unique, in the literal sense that each painting is a one-off, a true individual. When we feel a deep connection to an individual, sometimes we fall in love. "This is the most stunning artwork I have ever seen. You have an amazing talent. You have captured the essence of New Zealand, and given how amazing the scenery of this country is, you have done the impossible. You have inspired me to paint again. Thank you." "It is remarkable to be in the presence of the expression of genius! With gratitude for the ‘work' you do. May the genius you embody long continue to express itself." "Brilliant work - I am totally awestruck. Never seen something like this before - it’s unimaginable that the human eye can capture so much beauty and then reproduce it with such perfection - simply fantastic." "Never in my life has a painting made me feel how your paintings did. It’s a glimpse of eternity and beauty. Thank you for sharing your love with us." "It seems to me your personal mission, your personal task and duty is to show people the beauty of nature, the essence of life, the golden light that bounds everything together, what a beautiful gift and what a beautiful way to make people realise (and speechless)." "It’s wonderful to see an artist working in a medium that defies the digital revolution. The experience of standing in front of these works of art can not be abstracted - you have to stand in front of the object and let every layer affect you in real time. The eye is not static, it roams and explores, and this work encourages that. It is as absorbing and fluid as looking at the land itself. I am reminded of the luminous skies of Turner, the melting of structure and form of Cezanne and the lightscaping of Monet. 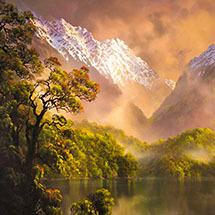 An oriental sensibility coming fingertip to fingertip with the beauty of New Zealand landscape. Thank you!" Imagine a timeless place. A place free of boundaries, free of emotional constraint and free of fear. Somewhere where the self peacefully blends with the infinite… of such breathtaking beauty that nothing else matters. We see this place in Tim’s magical paintings. His skill and vision encourage us to go beyond the physical and to experience something of the spirituality which, for Tim, is an integral part of these landscapes. 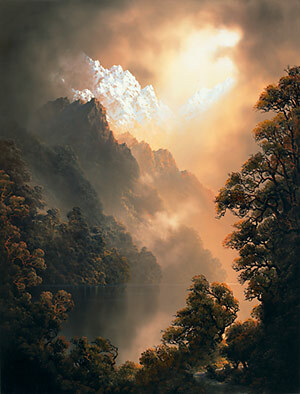 Tim paints real mountains, real lakes and real skies, but he is also deeply aware of the Spirit of Place. Perhaps it is the synergy of the factual and the intuitively understood that imbues his work with such extraordinary qualities. He paints the places he loves because they feed and excite him and because they are beautiful. We intuitively understand this, and the emotional response they engender in us is both welcome and deeply satisfying. The great beauty which Tim creates elevates and delights us. It is his gift to the world. Tim's paintings are slowly, carefully and skilfully built up with many layers of interference pigments. We are surrounded by screens and printed material. What many people don't realise is that these only offer a shallow experience of colour. Screens have only basic red green and blue light sources which vary in intensity to simulate different colours. Conventional printed material uses 4 colours of ink (cyan, magenta, yellow and black) in extremely thin layers to absorb selected wavelengths of light, allowing only some colours to reflect back to our eyes. Neither of these technologies can provide anywhere near the complexity and subtlety of genuine artists pigmented oil paint, which contains physical substances that interact with incoming light in fascinating and unique ways. At a molecular level, the pigment itself interacts with light to absorb and reflect specific wavelengths. Oil paint also contains other transparent components which can be built up into deep physical layers. As well as standard absorption and metallic pigments, Tim also uses interferences pigments which behave differently again. In these, light striking the surface is refracted, reflected and scattered by the layers that make up the pigment. Through a superimposition (or interference) of the reflected rays of light, a changing play of colour is created, with the most intense colour seen at the angle of reflection.The colors produced by interference are dependent on the angle of observation and illumination, and they will alternate with their complementary color as the angle changes. As a result, interference pigments are considered three-dimensional. The effect is striking. Tim's skill and experience in handling all these factors results in paintings that are filled with life. As the light changes they transform, taking on and evoking different characters and moods.